BlackBerry has thrown all of its traditional features at the Classic. The BlackBerry Classic is a perfect device for some and a complete irrelevance for most. If you love the old-school keyboard and can forgive the so-so performance it will appeal, otherwise it'll be a long way down your list. When you're down to 0.5% of the market share in global smartphone shipments, what do you do? If you're BlackBerry, the answer is go back to what you're best known for, namely full QWERTY keyboards, high-end security features and a focus on the business market. Enter the Classic, a handset that's very recognisably BlackBerry and which turns away from the iPhone-aping direction that last year's Z30 went in. The screen is touch-enabled but also square, geared more for spreadsheets than Candy Crush, while the keyboard underneath follows the Q10's lead by invoking the spirit of BlackBerrys past. It is distinctly BlackBerry, which may or may not be exactly what you're looking for from a mobile phone. It's not quite as unconventional as the Passport launched a couple of months ago, and it does offer something different to the Q10 in the form of the utility belt: four shortcut navigation keys and a touch-sensitive trackpad. Call, Menu, Back and End can handle everything from jumping back a screen to applying default actions, depending on the context. Three cheers for a smartphone that you can easily use in one hand. This belt has been a mainstay for BlackBerry in the past and die-hard fans will be glad to see it back - together with the QWERTY keyboard, BlackBerry is going all in with the Classic, a sort of greatest hits package of the company's past. In terms of specs you're getting a 3.5-inch, perfectly square 720 x 720 pixel display, a dual-core 1.5GHz Qualcomm 8960 processor, 2GB of RAM and 16GB of on-board storage (with a microSD card slot available for expanding that by up to 128GB if required). There's an 8MP auto-focus camera around the back, with an LED flash and 1080p video recording capabilities. Around the front you're limited to a two-megapixel camera and 720p video for those selfie shots (and important business video calls). Those specs are distinctly ho-hum but it's significantly cheaper than the top-end smartphones of today as a result: you can pick it up for $449 (around AU$550) in the US, £349 in the UK and $499 in Canada. That's a lot less than you're going to have to pay for an iPhone or flagship Android handset right now. In terms of form factor, it's chunky and heavy, with a rubbery, dimpled back and a thick metal band around the edges. It measures 131mm by 72.4mm by 10.2mm and weighs in at 177g (a touch heavier than the iPhone 6 Plus, though noticeably thicker as well). The Classic may not be the thinnest or the coolest-looking gadget out there, but it's comfortable to hold and there's little chance of this sliding out of your hand iPhone 6-style. It's easily usable in one hand, though two hands really helps power through some typing. It's on the bulky side but it's not an ugly device – the integration of ports, speakers, buttons and slots around the sides of the handset is particularly well done. The power button is on the top in the centre, with volume and mute buttons on the right. The mute button can also launch BlackBerry Assistant, of which more later. On the left you'll find the SIM and memory card slots while underneath there's the microUSB charging port with HDMI-out capabilities, a speaker and a microphone. Another speaker sits at the top next to the two-megapixel front-facing camera and notification LED. There's a 3.5mm audio jack up on top of the phone and the 8MP camera and flash are around the back towards the upper end – the unit protrudes ever-so-slightly from the back but it's not a problem at all. It feels a lot more durable and fingerprint-resistant than most of the flagship handsets on the market today, and in many ways it makes for a refreshing change not having to worry about breaking a phone or getting it smudged with fingerprints. The stainless steel frame offers a touch of style and the textured back is eminently grippable. It's not a head-turner in the design department but it feels dependable and smart – depending on your preference you might prefer it to the skinny models on show from some of BlackBerry's competitors. Think robustness rather than cutting-edge aesthetics. The 720 x 720 pixel screen isn't spectacular but it gets the job done. 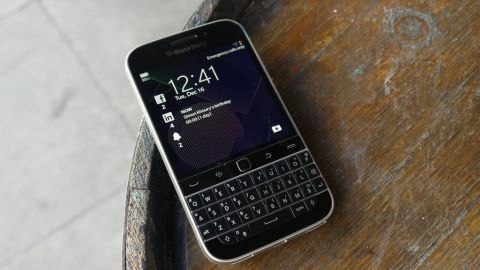 The QWERTY keyboard is everything you would expect from BlackBerry and can make a real difference once you get used to it. Small frets and metal ridges help you distinguish the keys without looking, but like the Q10 the Classic adopts a straight, boxed approach rather than the curved keyboards of older legacy BlackBerry devices. As for the display, it can't hold a candle to the latest and greatest screens on other handsets, but it does the job and won't let you down. Colours look bright and text looks sharp, and while the PPI is lower than the Q10, the overall screen space is greater, a trade-off that's worth making overall. Being able to use keyboard, trackpad or touchscreen for most operations is a lot more intuitive than you might think if you've never used a BlackBerry (or indeed a touchscreen) – it's akin to using the trackpad and keyboard shortcuts in tandem on a laptop, and you can quickly figure out the best and quickest way of accomplishing each task. The Classic isn't a dazzler as far as its design goes, but BlackBerry has put its components together in a way that feels substantial and reliable, which is probably exactly the effect it was looking for from the start.